Venus and Mars will shine near the crescent moon before dawn on Saturday, Nov. 6, 2015. Jupiter will be shining nearby. 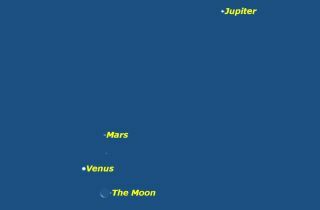 A spectacular gathering of three bright planets and a lovely waning crescent moon will be the chief celestial attraction in the predawn sky this weekend, with the moon, Venus, Mars and Jupiter all making an appearance. It will, in fact, be possible for anyone with a clear and unobstructed view of the southeast sky to see this foursome in a single glance. On Saturday (Nov. 7), three of these objects – Venus, Mars and the moon – will appear to crowd into a relatively small spot in the sky. The moon will be aligned with the dazzling Venus, what I would call the "nightlight of the early morning" and much dimmer Mars. This weekend's moon-and-planet sky show actually began early today (Nov. 6). Then, sky-gazers with clear weather had the chance to see brilliant Jupiter in the southeastern sky, sitting just to the left and slightly above the crescent moon. The two were separated by between the two will be a bit less than 3 degrees. A wide variety of different conjunctions and configurations involving the moon and planets typically occur during the course of any given year. It is highly unusual, however, when three or more bright planets plus the moon, appear to reside in the same small area of the sky. From our Earthly vantage point, we can readily observe Mercury, Venus, Mars, Jupiter and Saturn with our unaided eyes as they revolve around the sun. Each of these planets appears to move against the starry background at their own speeds and along their own tracks. It is obvious that since they are constantly moving at different speed, the positions of all five planets at any particular time is unique to that particular moment. All of the naked eye planets – and the moon as well – closely follow an imaginary line in the sky called the ecliptic. The ecliptic is also the apparent path that the sun appears to take through the sky as a result of the Earth's revolution around it. Technically, the ecliptic represents the extension or projection of the plane of the Earth's orbit out towards the sky. But since the moon and planets move in orbits, whose planes do not differ greatly from that of the Earth's orbit, these bodies, when visible in our sky, always stay relatively close to the ecliptic line. Twelve of the constellations through which the ecliptic passes form the Zodiac; their names which can be readily identified on standard star charts, are familiar to millions of horoscope users who would be hard pressed to find them in the actual sky. But will it have any effect on Earthly affairs? Ancient man probably took note of the fact that the planets – themselves resembling bright stars – had the freedom to wander in the heavens, while the other "fixed" stars remained rooted in their positions. This ability to move, seemed to have an almost magical, god-like quality. And evidence that the planets came to be associated with the gods, lies in their very names, which represent ancient deities. The skywatchers of thousands of years ago must have deduced that if the movements of the planets had any significance at all, it must be to inform those who could read celestial signs of what the fates held in store. Indeed, even to this day, there are those who firmly believe that the changing positions of the sun, moon and planets can have a decided effect on the destinies of individuals and nations on the Earth. But as for any chance that the impending planet lineup might have any influence on our lives in any way, we say forget it. No astrologer can predict from planetary alignments or any other celestial configuration when a specific event, good or bad, will occur on Earth. In fact, that's what a lot of people seem to do after a beautiful celestial array such as what is appearing in our early morning sky on Friday and Saturday seem to do: they forget about it. The planets in the night sky are always shifting in and out of celestial liaisons. And yet "astronomical amnesia" allows us to forget the last time we saw them assembling for such a performance. We also usually fail to recall that none of the influential magical thinking attributed to the previous event ever materialized.